But In my opinion we should still have enough space. And like I suggested the other day even if we don't its an excuse for all of us to be able to get out and explore the fair which i know we did not get to do last year! Sounds awesome. Plus I get a couple days off of work, a trip to NY and meeting you gents IRL. Pretty sweet deal if you ask me! they do need some holes drilled in them though for routing power wires and stuff. Yep, I can certainly try. I don't know if I will have access to cardstock, but hopefully I can find some kind of slightly thicker paper around the office. - The big summary board so people can see at-a-glance what we're doing. - 5 calculators for networking, 1 calculator for audio, 4 calculators for interactive, 3 calculators total for guestbook, GPS, and IRC. Anything there not yet accounted for? Do we have any extra blackboard/wood material at all currently that isn't being used for one of the displays? Did you get those fuses yet? Or are they at the post office waiting for you cause of your travels? I love how I'm an item to bring. well if you fly all this way and i leave you. That'd just be terrible! I can't think of too much else, but I'll keep thinking about it. They have arrived! I will solder them in later tonight or tomorrow. Looks really great! I can't wait to see these displays in action (which is partially why I wish we had a GPS display, but I don't know why I didn't think much about that until today. ). 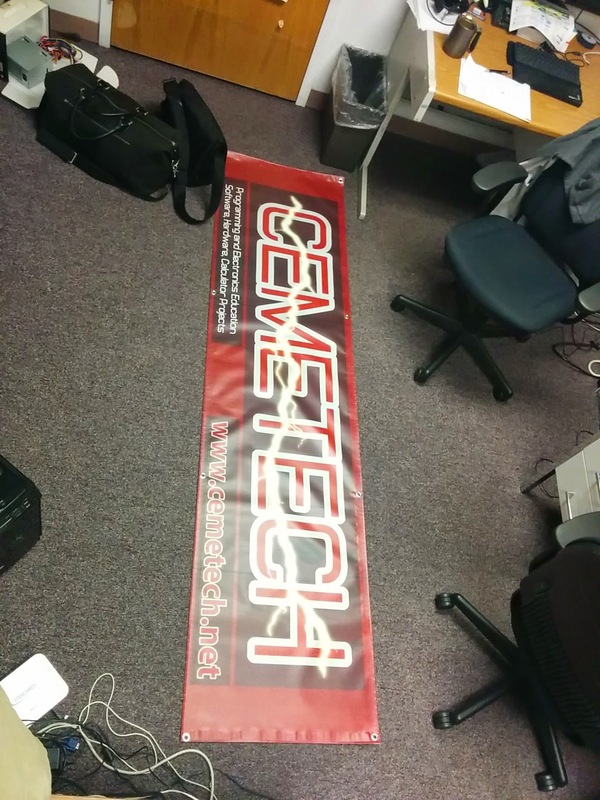 Also the giant banner arrived! Edit: We'll need at least one USB hub and a bunch of miniUSB cables for keeping TI-84+CSE and TI-Nspire calculators charged. I also need to load up all the games onto those calculators tomorrow. I have done the fuse replacements. 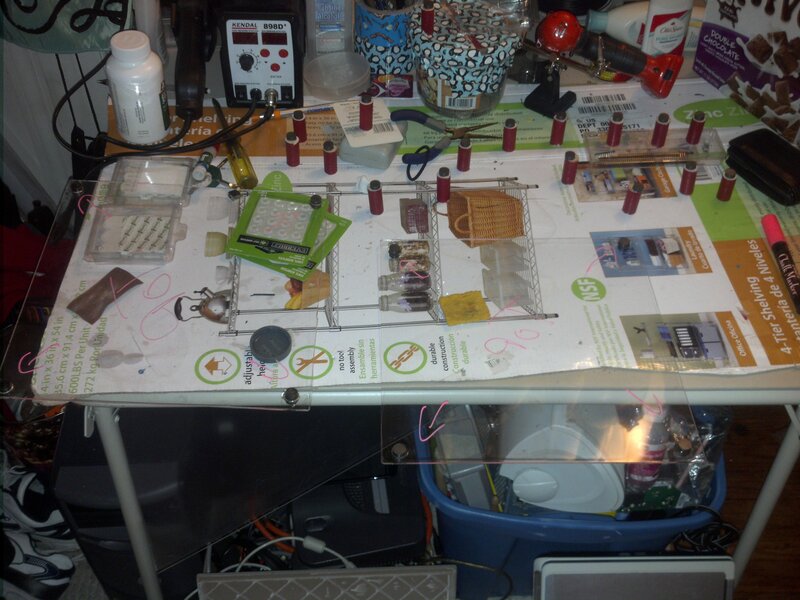 Edit #2: Gotta pop one of RFDave's gCn shields onto my Ardunio and flash it with the bridge code, as well as grab all my displays and wires from last year to make sure I'm not missing anything, as well. Edit #3: Need tablecloths. Need to find a quiet time to take a good, professional-looking video of one of us explaining each of our displays. Edit #4: Acquired two blue plastic tablecloths at a $0.99 store for $1.50 each (woo cheap plastic goods). I'll work on the bridge/shield now. © Copyright 2000-2019 Cemetech & Christopher Mitchell :: Page Execution Time: 0.682911 seconds.